The mobile payments solution market is quickly becoming crowded and complicated. Depending on the country you live in, the device you carry, the smartphone OS it runs, the bank you get your cards from, and maybe even your operator, chances are you have to use a very specific payment solution. And vendors, banks, developers, are left to figure out a way to make it work for the largest number of customers. Chinese users with a Xiaomi phone will have one more option now: Mi Pay. Launching today with China UnionPay, a large payment network similar to Visa and Mastercard, Mi Pay supports credit cards from 20 banks and debit cards from 12, including Bank of China, Industrial and Commercial Bank of China, China Construction Bank, Bank of Communications, and China Merchants Bank, as well as public transportation cards from six cities (that's another known payment method in China). The Mi Wallet app can tie up to 8 cards to one Xiaomi device and its users will also benefit from promos and rewards. Mi Pay works over NFC with China UnionPay POS terminals and uses multiple levels of security to ensure your data is safe. On the hardware front, it requires Xiaomi phones with NFC and a secure element chip that has passed the EAL 6+ test. During a transaction, it uses tokenization to avoid the transmission of plain text credit/debit card information. And on the app level, you will need to be signed in to your Mi Account to add a new card and you have to approve each transaction with a fingerprint scan. Finally, if you lose your phone, you can deactivate Mi Pay through its official website. BEIJING, 1 September 2016 — Xiaomi and China UnionPay, one of the world’s largest payment networks, jointly launched Mi Pay today, introducing a revolutionary way to pay with Xiaomi smartphones in China. At launch today, Mi Pay supports debit and credit cards from 20 banks. At the same time, Xiaomi announced that it now supports public transportation cards from six cities across China. With this, Xiaomi has become the first smartphone company in the world to support contactless payments through both bank cards and public transportation cards. Users can simply add their China UnionPay and public transportation cards to the Mi Wallet app, eliminating the need to bring their wallets out and making it even more convenient to go about their daily lives. As China’s only bank card association operating an interbank transaction settlement system, China UnionPay is now one of the world’s largest payment networks, alongside Visa and Mastercard. At launch, Mi Pay supports credit cards from 20 banks and debit cards from 12 banks including those from Bank of China, Industrial and Commercial Bank of China, China Construction Bank, Bank of Communications and China Merchants Bank. In recent years, NFC technology has been dramatically changing the landscape of mobile payments in China. 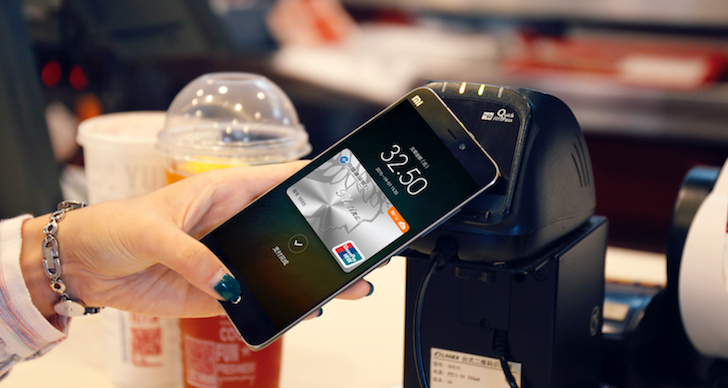 Mi Pay makes use of NFC technology — Xiaomi smartphones with NFC (for example, Mi 5) have a built-in NFC chip with a separate secure element chip that has passed the “EAL 6+” security test. Through a variety of tests, the secure element chip has been proven to withstand a variety of invasive, semi-invasive and non-invasive attacks, providing users with the highest level of data protection and encryption. 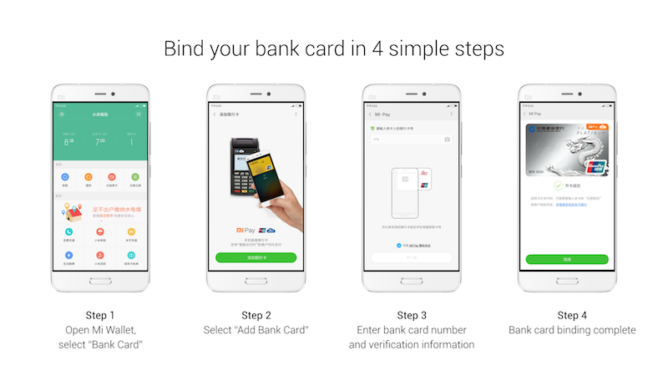 Binding a bank card to Mi Pay takes just four steps: Open the Mi Wallet app, select the option to add a bank card, key in the bank card details, and go through SMS verification for final confirmation. In stores, instead of having to swipe a card when making payment, users just have to hold their device near China UnionPay’s QuickPass-enabled POS terminals and the bank card details will pop up. After fingerprint verification, the device is then activated and can be used as a bank card. This results in an extremely simplified payment process: users can complete their transactions just by holding their smartphone near the POS terminal with a finger on the fingerprint scanner. China UnionPay is a bank card association that has become a crucial part of China’s bank card industry, playing an essential role in the interconnection between bank card systems. Its main responsibilities include establishing and operating an inter-bank transaction settlement system in China, and promoting unified bank card standards and specifications.